Before any word about what we are presenting here continued to the course, We have to thank David Rutten, McNeel & Associates and All People who have taken part in developing Grasshopper. Sharing is the greatest part of developing levels of knowledge and by all means Ardaena appreciate every hour spent on the whole story behind by any one. This course has been built upon getting to know algorithmic thinking toward learning how to use programming language as Gh to handle different problem solving scenarios. The course is related to actual workshop has been held before and will be extended for participants by special packs. 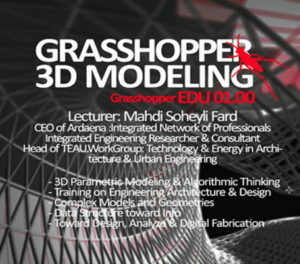 The Course also has been recorded in Persian for Iranian interested in Grasshopper basically in Iran but, we are welcome to everyone around the world. 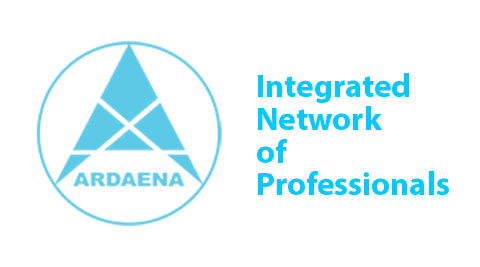 One of the greatest feature of this pack is the Algorithmic Engineering part which is related to the whole experience of Ardaena team in professional projects. Parametric Modeling? Or Parametric Designing or Parametric Architecture? This is totally true that each phrase above has its own definition which it takes time to know them deeply and the path from A to Z on each if it’s related to what you want or not. However, it’s almost coming up with the idea of complex Geometries which needs to be discussed. Solving this issue is actually standing on the question which asks: “How parameters can effect on design process?” the main aim is moving toward information and data specially when we talk about parameters it means what can be measured. Adapted to updated researches are all around, architecture and engineering are also has been gotten involved by Data and Information. In spite of low level understanding which might be defined on Parametricism as complex models, it seems that in a brief this approach is actually telling us to have a better understanding of relations and proportions between parameters from different factors. The deeper relations and special proportions we could write the more qualified responses we can have both in architecture or engineering and design. These series of workshops defined a two path one for students as EDU on getting acquaintance with the thoughts and learning the basics and the other one as PRO is to have these thoughts being confirmed on details and special algorithms to have much more accurate answers to the issues. Both parts actually had Grasshopper as the main language to discuss and just as a challenge the Pro series have C# developing on the last step. 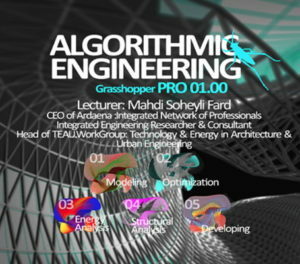 You can Download the Course Description include Curriculum of both Algorithmic Engineering and Parametric Modeling.